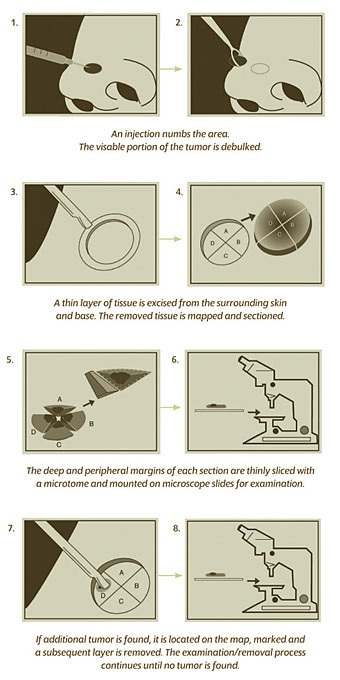 Mohs Surgery (technically known as Mohs Micrographic Surgery) is the most successful method ever developed for the treatment of skin cancer. While not appropriate for every skin cancer, it is the treatment of choice for skin cancer of the head and neck, large or recurrent tumors, or cancers that display an aggressive growth pattern. Clinical studies have shown that Mohs surgery has the highest cure rate of any form of skin cancer treatment. Cure rates exceed 99% for many cancers. No longer does the patient have to accept a high recurrence rate, or be told to simply "expect that the cancer will come back." Surprisingly, Mohs surgery can achieve these high cure rates with smaller, less destructive procedures compared to the older, less precise methods of surgery. This means lower costs. Studies have shown that Mohs surgery is comparable in cost to, or less expensive than alternative treatments. For most people, Mohs surgery is very easy to undergo. The cancer can be removed in the doctor's office using a local anesthetic. Hospitalization or even the use of an outpatient ambulatory surgery center is unnecessary. For most patients, the work is completed in the course of a single day at the Dermatology and Skin Cancer Clinic of Alaska.